For that all-important finishing touch a stylish headboard provides a focal point in your bedroom. When choosing the right headboard for your bed there are a number of things to consider such as the size and type of your bed, size of your bedroom, colour, design and finish, functionality, and whether you would like a wall mounted or attached design. Consider also the height of headboard you would like and the people who will be using it. For example children won't need a headboard as high as an adult. For a more sophisticated and modern feel, choose a headboard that is slightly wider than your bed, taking into account and bedside furniture you may have. Headboards are available in a wide range of materials from upholstered and leather, through to wood and metal, so you will be spoilt for choice. 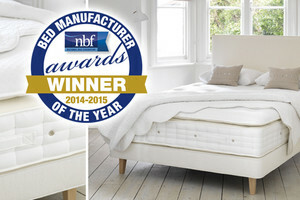 Leading bed manufacturers Respa, Balmoral and the Natural Sleep Company also manufacture stylish headboards to complement their range of divan beds. Upholstered headboards offer comfort and style and can create a bold statement in your bedroom. With so many striking patterned fabrics available, a buttoned-back headboard or panelled effect design can offer a stylish, streamlined look and offer a modern edge. A padded or upholstered headboard is ideal if you like to read or sit up in bed as they will provide a comfortable back and neck rest. For a more streamlined, contemporary look a genuine leather or faux leather headboard is perfect. Available in a range of colours from black and brown to cream and white, leather is a durable product offering you years of comfort. Wooden headboards remain a popular choice and are great for are great for country-style bedrooms and traditional bedroom décor. Solid Oak Headboards, mahogany, walnut and cheery wood are a premium product and have great longevity. Softer woods such as pine, or painted wood finishes won’t have the same durability but they are sturdy designs. For a romantic or antique look, brass, nickel or painted metal headboard is ideal. Chrome and metal headboards are an affordable option and are particularly good for children’s rooms. Choose online from our large selection of single, small double, double, king size and super king size headboards or visit us in store at Dalzell's of Markethill. Delivery is free throughout Northern Ireland and Counties Louth, Monaghan and Dublin with competitive rates across the rest of Ireland (daily runs to Belfast and Dublin). The Hypnos Vienna 5' Divan Headboard is a deep-buttoned design in an exquisite ‘winged’ EuroWide style. The side wings, with piped detail, wrap around the head of the bed to provide a real design statement. Measuring 134cm high by 9cm deep with ‘wings’ 30cm deep at their base, this luxurious upholstered headboard comes in a wide selection of fabric finishes. . Shown above in Slate Weave upholstered fabric. The Hypnos Victoria 4' 6"' Divan Headboard is a sumptuous EuroSlim rectangular-piped headboard with two rows of four square segments. Measuring 161cm high by 9cm deep, this sumptuous headboard is available in a choice of upholstered finish. The Hypnos Grace 4' 6" Divan Headboard is a deeply upholstered headboard design with three rows of deep-buttoned squares. Measuring 77cm high by 9cm deep, this modern headboard is available in a range of fabric finishes.